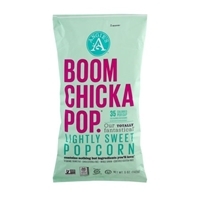 Ingredients you'll love: popcorn, dried cane sugar, sunflower oil, sea salt. Gluten free. Gluten free. 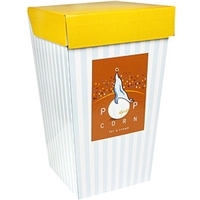 Whole grain non-gmo pop corn (100%), partially hydrogenated soybean and/or cottonseed oil, salt, natural and artificial flavors, annatto for coloring, soy lecithin. Gluten free. Gluten free.contains: milk and soy ingredients. Cornmeal, rice flour, vegetable oil (expeller pressed canola oil and/or sunflower oil and/or corn oil), cheddar cheese (cultured milk, salt, enzymes), dried whey, dried buttermilk, salt, citric acid, sea salt, black pepper extract. Gluten free.contains milk. 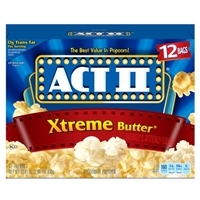 Brand/Manufacturer: Act II ConAgra Foods Inc.
POPPING CORN, PALM OIL, BUTTER, SALT, LESS THAN 2% OF: NATURAL AND ARTIFICIAL FLAVORS, COLOR ADDED, TBHQ AND CITRIC ACID (FOR FRESHNESS). 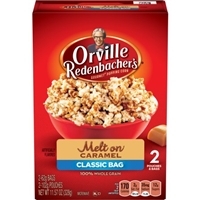 Pouch: brown sugar, margarine (partially hydrogenated soybean and cottonseed oil, water, salt, soy lecithin, vegetable mono- and diglycerides, nonfat dry milk solids, beta-carotene [color], vitamin a palmitate), corn syrup, less than 2% of: artificial flavor, caramel color. 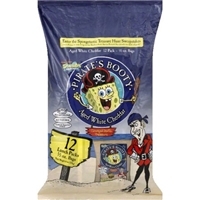 Bag: whole grain popping corn, palm oil, less than 2% of tbhq and citric acid (for freshness).contains: milk, soy. Kids safety: while popcorn is a delicious snacking choice, it is never recommended for infants or toddlers, as the popped kernels can pose a choking threat to their safety. 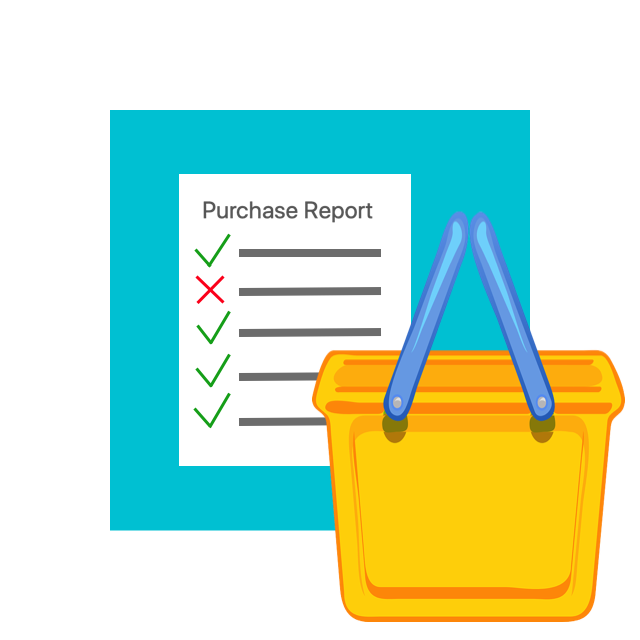 Peanuts, milk chocolate candies (milk chocolate [sugar, chocolate, skim milk, cocoa butter, lactose, milkfat, soy lecithin, salt, artificial flavors], sugar, cornstarch, less than 1%: corn syrup, dextrin, coloring [includes blue 1 lake, yellow 6, red 40, yellow 5, blue 1, red 40 lake, blue 2 lake, yellow 6 lake, yellow 5 lake, blue 2], gum acacia), raisins coated with less than 1% sunflower, and/or canola oil, cashews, vegetable oil (peanut, cottonseed, soybean, and/or sunflower seed), sea salt. 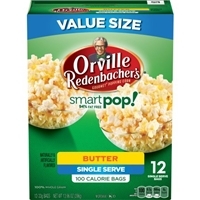 100% orville redenbacher's gourmet popping corn. 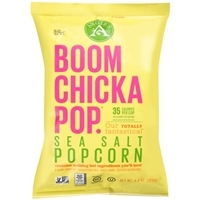 Whole grain popping corn, palm oil, salt, less than 2% of: potassium chloride, natural and artificial flavors, butter, color added, tbhq and citric acid (for freshness). Gluten free. Gluten free.kids safety: while popcorn is a delicious snacking choice, it is never recommended for infants or toddlers, as the popped kernels can pose a choking threat to their safety. Contains: milk. 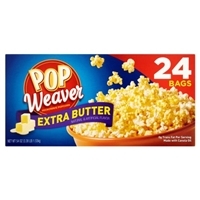 POP WEAVER EXTRA BUTTER POPCORN OFFERS TIMELESSLY DELICIOUS POPCORN THAT COMES OUT OF THE MICROWAVE WARM AND FLUFFY.POP WEAVER POPCORN DELIGHTS YOUR SENSES WITH THE FLAVORFUL TASTE AND DELIGHTFUL AROMA OF MELTED BUTTER.THE EXTRA BUTTER VARIETY ENSURES THE WARM, BUTTERY TASTE ON EVERY KERNEL. 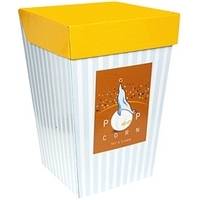 Brand/Manufacturer: Pop Weaver Weaver Popcorn , Inc. 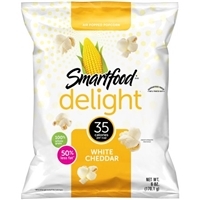 Popcorn, canola oil, salt, contains 2% or less of the following: natural & artificial flavor, color added, tbhq and citric acid to preserve freshness, hydrogenated vegetable oil (corn, cottonseed, soybean or sunflower). Gluten free. Gluten free.contains milk ingredients. 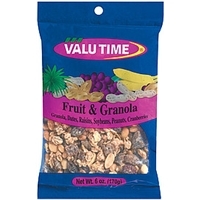 Granola (whole oats, brown sugar, whole grain wheat, rice, corn syrup, almonds, salt, partially hydrogenated cottonseed and soybean oil, modified corn starch, cinnamon, nonfat milk, malt flavorings, polyglycerol esters of fatty acids), dates (dates, sugar), raisins, soybeans (soybeans), sunflower oil (sunflower oil, cottonseed oil and/or peanut oil, salt), dried cranberries (cranberries, sugar). Contains wheat, tree nuts, milk, soy, peanuts. 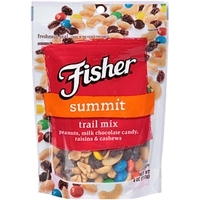 Allergen information: this product is produced on packaging equipment shared with peanut and tree nut products. 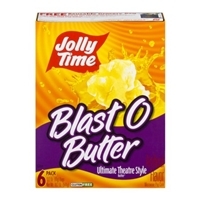 POPCORN, VEGETABLE OIL (SUNFLOWER, CORN, AND/OR CANOLA OIL), MALTODEXTRIN (MADE FROM CORN), REDUCED LACTOSE WHEY, CHEDDAR CHEESE (MILK, CHEESE CULTURES, SALT, ENZYMES), SALT, WHEY PROTEIN CONCENTRATE, WHEY, NATURAL FLAVORS, BUTTERMILK, POTASSIUM CHLORIDE, LACTIC ACID, AND CITRIC ACID. Brown sugar, popcorn, semi-sweet chocolate (sugar, chocolate liquor soya lecithin [as an emulsifier] vanillin [an artificial flavor]0, corn syrup, may contain one or both of the following: (corn oil, safflower oil), margarine (liquid corn oil, partially hydrogenated soybean oil, water, vegetable mono & di-glycerides, soy lecithin [as an emulsifier], potassium sorbate and calcium disodium edta [to preserve freshness], phosphoric acid [acidulant] vitamin a palmitate, colored with beta carotene [a source of vitamin a], artificial flavor, vitamin d3), pure vanilla extract, baking soda, vanillin (an artificial flavor), soy lecithin (as an emulsifier).contains soy. May contain wheat. 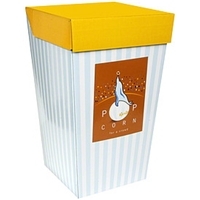 Popcorn, sugar, may contain one or both of the following: (corn oil, safflower oil), pure vanilla extract, salt.contains soy. May contain wheat. 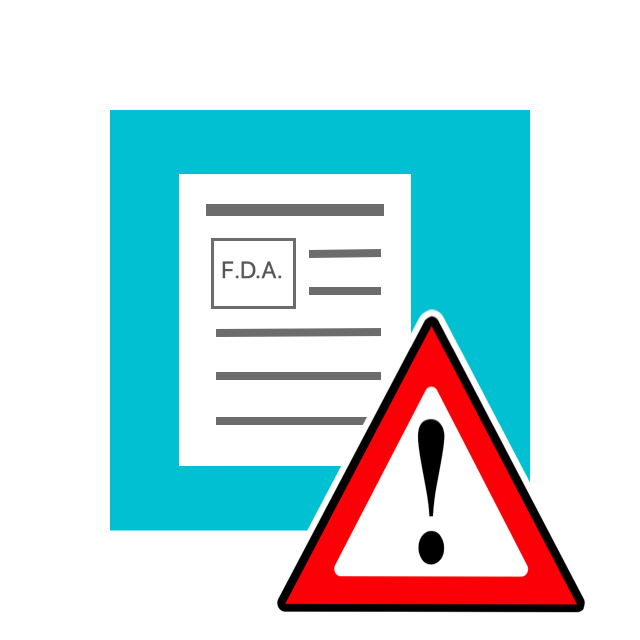 Brown sugar, popcorn, corn syrup, may contain one or both of the following: (corn oil, safflower oil), margarine (liquid corn oil, partially hydrogenated soybean oil, water, vegetable mono & di-glycerides, soy lecithin [as an emulsifier], potassium sorbate and calcium disodium edta [to preserve freshness], phosphoric acid [acidulant] vitamin a palmitate, colored with beta carotene [a source of vitamin a], artificial flavor, vitamin d3), pure vanilla extract, baking soda, soy lecithin (as an emulsifier).contains soy. May contain wheat. 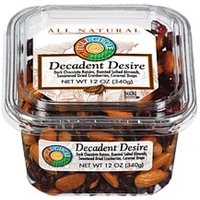 Dark chocolate raisins (chocolate [sugar, chocolate liquor, cocoa butter, milk fat, soy lecithin-an emulsifier, natural vanilla flavor], raisins, tapioca dextrin, confectioner's glaze); almonds (peanut or canola oil, salt); glycerated sweetened dried cranberries (cranberries, sugar, glycerin, citric acid, sunflower oil); caramel bits (sugar, corn syrup, liquid sugar, skim milk, palm oil, butter [cream, salt], mono-and diglycerides, natural flavor, soy lecithin). 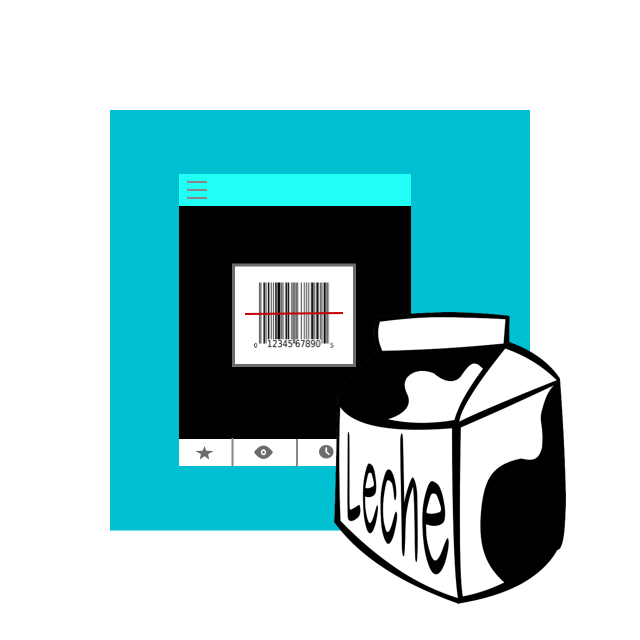 Produced on shared equipment for tree nuts/peanuts, wheat, soy, milk and sesame seeds. May contain shell pieces.